Soba, Japanese buckwheat noodles are the traditional Japanese fast food, developed centuries ago as the perfect instant meal. Like many of Japan's traditional foods, behind its image of utter simplicity, soba has been a tradition for centuries steeped in the lore of regional areas. Sakurai Noodle Company is located in Nagano, the heart of the land once known as Shinano, and recognized widely as the "home of soba." 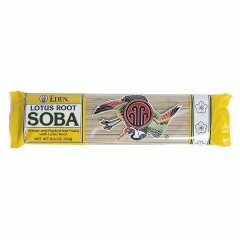 40% Soba is a delicious, country-style pasta made from a blend of whole buckwheat flour and wheat flour. Enjoy in a savory tamari broth, topped with steamed vegetables or tempura. Or try it in salads, fried noodle dishes, or topped with tahini sauce. Due to its versatility and heartiness, 40% soba is Japan's most popular soba blend. Ito (thread) Soba, known as angel-hair soba, is the premium cut of buckwheat noodle. The Sakurai family selects only the finest organic buckwheat and wheat, which they freshly mill for each batch. After carefully mixing, rolling and cutting the dough, the noodles are slowly and naturally dried at room temperature. Light, delicate, and smooth-textured, it is traditionally served cold in summer with a small bowl of shoyu-seasoned dipping sauce. Ito Soba can be enjoyed in hot broth as well, and it makes refreshing and energizing summer salads. Jinenjo (Japanese mountain yam) is a hardy root vegetable long prized in the Orient for its strengthening and rejuvenating qualities. 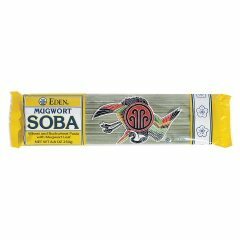 Sakurai organic Jinenjo Soba is a flavorful and energizing pasta with a delightfully smooth texture. In Japan, jinenjo soba is most commonly enjoyed in hot shoyu-seasoned broth. It is also perfect for fried noodles or topped with your favorite sauce. Jade green from mugwort leaf Artemesia princeps a wild herb prized for promoting cleansing and digestion. A traditional bracing food that looks, tastes, and makes you feel great. Mugwort soba is made of hard winter and spring wheat, whole buckwheat flour, mugwort leaf, and a bit of sea salt. Tanaka family made as they've been doing it since 1906, now with four generations actively involved. Enjoy hot or chilled in dashi broth with shoyu, kombu sea vegetable, shiitake mushroom, and mirin, or drizzled with ponzu. Use like any pasta in soups, stir-fries, and salads. Wrap them in toasted nori to make delicious noodle sushi. It provides protein, complex carbs, and iron. Lotus root soba of hard winter and hard spring wheat, whole buckwheat flour, lotus root powder, and a bit of sea salt. Lotus root of a water lily, Nelumbo nucifera, is traditionally valued for promoting healthy respiratory function. It imparts a creamy smooth texture. Tanaka family made as they've been doing it since 1906, now with four generations actively involved. A delicious, warming and strengthening food to enjoy hot or chilled in dashi broth with shoyu, kombu sea vegetable, shiitake mushroom, and mirin, or drizzled with ponzu. Use like any pasta in soups, stir-fries, and salads. Wrap it in toasted nori to make noodle sushi. Provides healthy fiber, protein, complex carbohydrate, and iron.